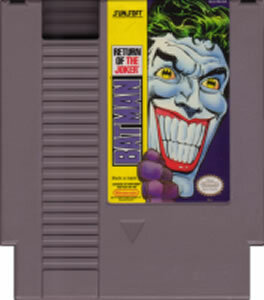 Batman Return Joker original NES Nintendo Game cartridge only - Cleaned Tested and Guaranteed to Work! I got this for my son,he had been looking for it for some time . It was in very ,very good cond. Everything I have got from Lukie has been in new to great cond. I LOVE BUYING FROM THEM!!!!!!!!!!!!!!!! I don't care what other people say about this game 'cause it has everything: cool graphics, challengue, awesome music and more! Don't think twice..if u like batman and a good challengue this is your game. 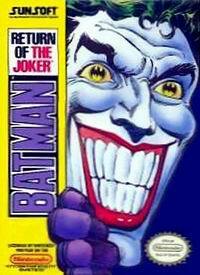 What can I say about "batman return of the joker?" Well lets start by looking at the cartridge. 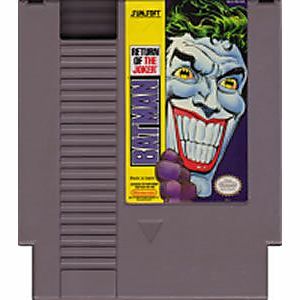 I love the cover of this cartridge, with the bright yellow streak, with the purple batman down the side and the jokers face and big smile,I love looking at it, great art work! It Makes me wanna pop it in and play some batman! Yeah this is got to be a killer game, when you think of batman you think of all the cool weapons he has right? well forget about,in this batman he shoots his enemies as it's known as the "contra" Batman".Which by the way is an amazing game and series. The Return of the joker's gameplay is not that bad. The graffics are cool and so is the music. The control are alight but you get fustrated because you wannna punch or kick sometimes, The best way to describe it is to stick out your arm, make a fist evertime you shoot,thats it. Your weapons is this spray gun like "contra" but not the same, and some other ones. The boss fights are like a point system like,you both start with 50000 and when you damage the enemy or take damage it knocks of points? it's kinda weird, but that what it is. I have mixed feelings about this game, some is good and some is bad, hot and cold, not necessarily in that order.